SonicWALL "Price Fighter" Promotion: Get up to 20% off when you buy a SonicWALL NSA X600 Series Firewall or a SonicWALL SuperMassive 9X00 Series Firewall with 3 years of SonicWALL Advanced Gateway Security Suite and Capture Security Center. The SonicWALL SuperMassive Series is SonicWALL’s next-generation firewall (NGFW) platform designed for large networks to deliver scalability, reliability and deep security at multi-gigabit speeds with near zero latency. Built to meet the needs of enterprise, government, education, retail, healthcare and service provider, the SuperMassive Series is ideal for securing distributed enterprise networks, data centers and service providers. The combination of SonicWALL’s SonicOS operating system, patented* ReassemblyFree Deep Packet Inspection (RFDPI) technology and massively multi-core, highly scalable hardware architecture, the SuperMassive E10000 and 9000 Series deliver industry-leading application control, intrusion prevention, malware protection and TLS/SSL decryption and inspection at multi-gigabit speeds. The SuperMassive Series is thoughtfully designed with power, space and cooling (PSC) in mind, providing the leading Gbps/watt NGFW in the industry for high performance packet and data processing, application control and threat prevention. The SonicWALL RFDPI engine scans every byte of every packet across all ports, delivering full content inspection of the entire stream while providing high performance and low latency. This technology is superior to proxy designs that reassemble content using sockets bolted to anti-malware programs, which are plagued with inefficiencies and the overhead of socket memory thrashing, which leads to high latency, low performance and file size limitations. The RFDPI engine delivers full content inspection to eliminate various forms of malware before they enter the network and provides protection against evolving threats - without file size, performance or latency limitations. The RFDPI engine also performs full decryption and inspection of TLS/SSL and SSH encrypted traffic as well as non-proxyable applications, enabling complete protection regardless of transport or protocol. It looks deep inside every packets (the header and data part) searching for protocol noncompliance, threats, zero-days, intrusions, and even defined criteria to detect and prevent hidden attacks that leverage cryptography, block encrypted malware downloads, cease the spread of infections, and thwart command and control (C&C) communications and data exfiltration. Inclusion and exclusion rules allow total control to customize which traffic is subject to decryption and inspection based on specific organizational compliance and/or legal requirements. Application traffic analytics enable the identification of productive and unproductive application traffic in real time, and traffic can then be controlled through powerful application-level policies. Application control can be exercised on both a per-user and pergroup basis, along with schedules and exception lists. All application, intrusion prevention and malware signatures are constantly updated by the SonicWALL Threats Research Team. Additionally, SonicOS, an advanced purpose-built operating system, provides integrated tools that allow for custom application identification and control. The SonicWALL SuperMassive 9000 Series features 4 x 10-GbE SFP+, up to 12 x 1-GbE SFP, 8 x 1-GbE copper and 1 GbE management interfaces, with an expansion port for an additional 2 x 10- GbE SFP+ interfaces (future release). The 9000 Series features hot-swappable fan modules and power supplies. Reassembly-Free Deep Packet Inspection (RFDPI) This high-performance, proprietary and patented inspection engine performs stream-based bi-directional traffic analysis, without proxying or buffering, to uncover intrusion attempts, malware and identify application traffic regardless of port. Single-pass inspection A single-pass DPI architecture simultaneously scans for malware, intrusions and for application identification, drastically reducing DPI latency and ensuring that all threat information is correlated in a single architecture. Threat API All the firewall to receive and leverage any and all proprietary, original equipment manufacturer and third-party intelligence feeds to combat advanced threats such as zero-day, malicious insider, compromised credentials, ransomware and advanced persistent threats. High availability/clustering The NSA Series supports Active/Passive with state synchronization, Active/Active DPI and Active/ Active Clustering high availability modes. 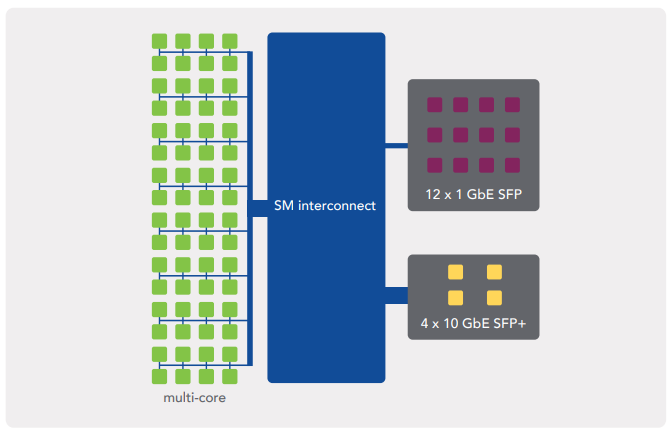 Active/Active DPI offloads the Deep Packet Inspection load to cores on the passive appliance to boost throughput. IPv6 support Internet Protocol version 6 (IPv6) is in its early stages to replace IPv4. With the latest SonicOS 6.2, the hardware will support filtering and wire mode implementations. Flexible deployment options The NSA Series can be deployed in traditional NAT, Layer 2 Bridge, Wire Mode, and Network Tap modes. WAN load balancing Load-balances multiple WAN interfaces using Round Robin, Spillover or Percentage methods. Policy-based routing Creates routes based on protocol to direct traffic to a preferred WAN connection with the ability to fail back to a secondary WAN in the event of an outage. Advanced quality of service (QoS) Guarantees critical communications with 802.1p and DSCP tagging, and remapping of VoIP traffic on the network. 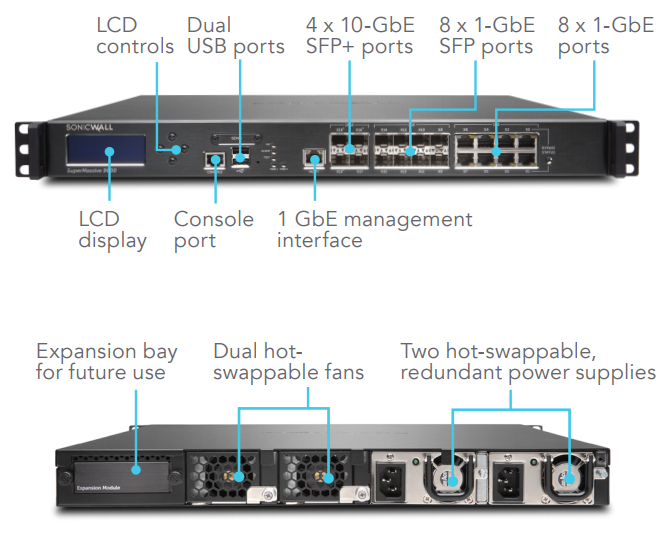 Integrated Dell X-Series network switch management Manage security settings of additional ports, including Portshield, HA, POE and POE+, under a single pane of glass using the SuperMassive management dashboard for Dell’s X series network switch. Open Authentication and Social Login Enable guest users to use their credentials from social networking services such as Facebook, Twitter, or Google+ to sign in and access the Internet and other guest services through a host's wireless, LAN or DMZ zones using pass-through authentication. Global Management System SonicWALL GMS monitors, configures and reports on multiple SonicWALL appliances through a single management console with an intuitive interface, reducing management costs and complexity. Powerful single device management An intuitive web-based interface allows quick and convenient configuration, in addition to a comprehensive CLI and support for SNMPv2/3. IPFIX/NetFlow application flow reporting Exports application traffic analytics and usage data through IPFIX or NetFlow protocols for realtime and historical monitoring and reporting with tools, such as SonicWALL Scrutinizer or other tools that support IPFIX and NetFlow with extensions. Auto-provision VPN Simplifies and reduces complex distributed firewall deployment down to a trivial effort by automating the initial siteto-site VPN gateway provisioning between SonicWALL firewalls while security and connectivity occurs instantly and automatically. IPSec VPN for site-to-site connectivity High-performance IPSec VPN allows the NSA Series to act as a VPN concentrator for thousands of other large sites, branch offices or home offices. User activity tracking User identification and activity are made available through seamless AD/LDAP/Citrix/Terminal Services SSO integration combined with extensive information obtained through DPI. GeoIP country traffic identification Identifies and controls network traffic going to or coming from specific countries to either protect against attacks from known or suspected origins of threat activity, or to investigate suspicious traffic originating from the network. Ability to create custom country and Botnet lists to override an incorrect country or Botnet tag associated with an IP address. Eliminates unwanted filtering of IP addresses due to misclassification. Regular Expression DPI filtering Prevents data leakage by identifying and controlling content crossing the network through regular expression matching. Ability to create custom country and Botnet lists to override an incorrect country or Botnet tag associated with an IP address. Broad File Type Analysis Supports analysis of a broad range of file types, including executable programs (PE), DLL, PDFs, MS Office documents, archives, JAR, and APK plus multiple operating systems including Windows, Android, Mac OSX and multi-browser environments. Rapid Deployment of Signatures When a file is identified as malicious, a signature is immediately deployed to firewalls with SonicWALL Capture subscriptions and GRID Gateway Anti-Virus and IPS signature databases and the URL, IP and domain reputation databases within 48 hours. TLS/SSL decryption and inspection Decrypts and inspects SSL traffic on the fly, without proxying, for malware, intrusions and data leakage, and applies application, URL and content control policies in order to protect against threats hidden in SSL encrypted traffic Included with security subscriptions for all models except SOHO. Sold as a separate license on SOHO. Protocol abuse/anomaly detection and prevention Identifies and blocks attacks that abuse protocols in an attempt to sneak past the IPS. Gateway anti-malware The SonicWALL RFDPI engine scans all inbound, outbound and intra-zone traffic for viruses, Trojans, key loggers and other malware in files of unlimited length and size across all ports and TCP streams. CloudAV malware protection A continuously updated database of over 17 million threat signatures resides in the SonicWALL cloud servers and is referenced to augment the capabilities of the onboard signature database, providing RFDPI with extensive coverage of threats. Inside/outside content filtering Enforce acceptable use policies and block access to websites containing information or images that are objectionable or unproductive with Content Filtering Service. Enforced content filtering client Extend policy enforcement to block internet content for Windows, Mac and Android devices located outside the firewall perimeter. Automated enforcement option Ensure every computer accessing the network has the most recent version of anti-virus and anti-spyware signatures installed and active, eliminating the costs commonly associated with desktop anti-virus and anti-spyware management. RFDPI is a single-pass, low latency inspection system that performs stream-based, bi-directional traffic analysis at high speed without proxying or buffering to effectively uncover intrusion attempts, malware and identify application traffic regardless of port and protocol. This proprietary engine relies on streaming traffic payload inspection in order to detect threats at Layers 3-7. The RFDPI engine takes network streams through extensive and repeated normalization and decryption in order to neutralize advanced obfuscation and evasion techniques that seek to confuse detection engines and sneak malicious code into the network. Once a packet undergoes the necessary pre-processing, including TLS/SSL decryption, it is analyzed against a single proprietary memory representation of multiple signature databases: intrusion attacks, malware, botnet and applications. The connection state is then advanced to represent the position of the stream relative to these databases until it encounters a state of attack, or other “match” event, at which point a preset action is taken. In most cases, the connection is terminated and proper logging and notification events are created. However, the engine can also be configured for inspection only or, in the case of application detection, to provide Layer 7 bandwidth management services for the remainder of the application stream as soon as the application is identified. The RFDPI engine is purposely designed with a keen focus on providing security scanning at a high level of performance, to match both the inherently parallel and ever growing nature of network traffic. When combined with multi-core processor systems, this parallelismcentric software architecture scales up perfectly to address the demands of deep packet inspection (DPI) at high traffic loads. The SuperMassive platform relies on processors that, unlike x86, are optimized for packet, crypto and network processing while retaining flexibility and programmability in the field - a weak point for ASICs systems. This flexibility is essential when new code and behavior updates are necessary to protect against new attacks that require updated and more sophisticated detection techniques. Another aspect of the platform design is the unique ability to establish new connections on any core in the system, providing ultimate scalability and the ability to deal with traffic spikes. This approach delivers extremely high new session establishment rates (new conn/sec) while deep packet inspection is enabled - a key metric that is often a bottleneck for data center deployments. The dedicated, in-house SonicWALL Threats Research Team works on researching and developing countermeasures to deploy to the firewalls in the field for up-to-date protection. The team leverages more than one million sensors across the globe for malware samples and for telemetry feedback on the latest threat information, which in turn is fed into the intrusion prevention, anti-malware and application detection capabilities. SonicWALL NGFW customers with the latest security capabilities are provided continuously updated threat protection around the clock, with new updates taking effect immediately without reboots or interruptions. The signatures on the appliances protect against wide classes of attacks, covering up to tens of thousands of individual threats with a single signature. In addition to the countermeasures on the appliance, SuperMassive firewalls also have access to the SonicWALL CloudAV Service, which extends the onboard signature intelligence with more than seventeen million signatures, and growing. This CloudAV database is accessed via a proprietary, lightweight protocol by the firewall to augment the inspection done on the appliance. 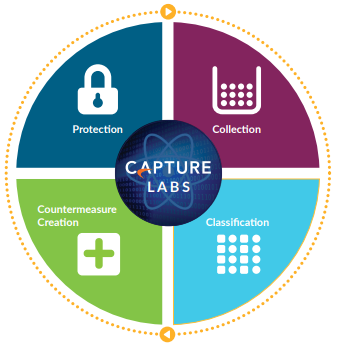 With Capture Advanced Threat Protection, a cloud-based network sandbox, organizations can examine suspicious files and code in an isolated environment to stop advanced threats such as zeroday attacks. Application intelligence informs administrators of application traffic traversing their network so they can schedule application controls based on business priority, throttle unproductive applications and block potentially dangerous applications. Real-time visualization identifies traffic anomalies as they happen, enabling immediate countermeasures against potential inbound or outbound attacks or performance bottlenecks. 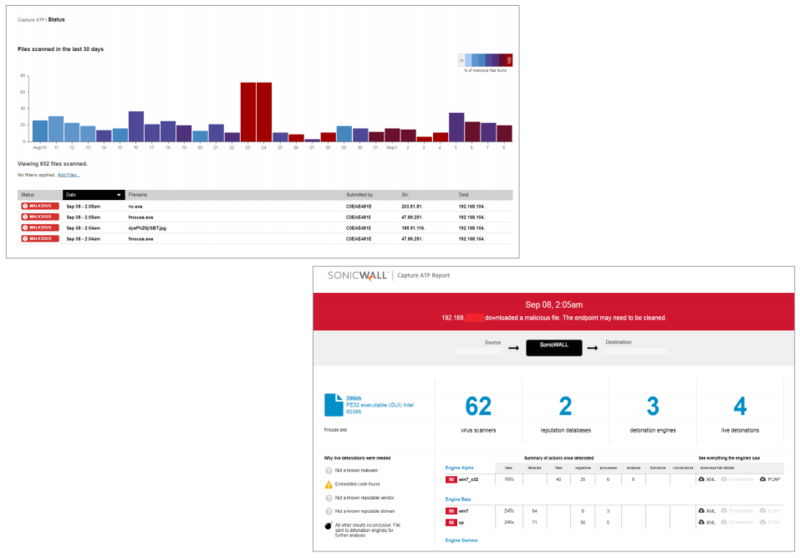 SonicWALL Application Traffic Analytics provide granular insight into application traffic, bandwidth utilization and security threats, as well as powerful troubleshooting and forensics capabilities. Additionally, secure single sign-on (SSO) capabilities ease the user experience, increase productivity and reduce support calls. Management of application intelligence and control is simplified by the intuitive webbased interface. 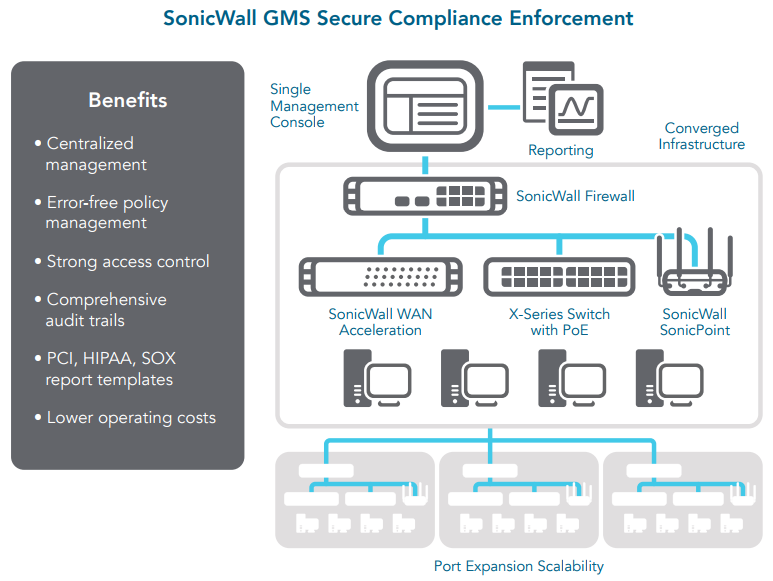 For highly regulated organizations wanting to achieve a fully coordinated security governance, compliance and risk management strategy, the optional SonicWALL Global Management System (GMS) provides administrators a unified, secure and extensible platform to manage SonicWALL firewalls, wireless access points and switches through a correlated and auditable workstream process. GMS enables enterprises to easily consolidate the management of security appliances, reduce administrative and troubleshooting complexities, and govern all operational aspects of the security infrastructure, including centralized policy management and enforcement; real-time event monitoring; user activities; application identifications; flow analytics and forensics; compliance and audit reporting; and more. GMS also meets the firewall change management requirements of enterprises through a workflow automation feature. With GMS workflow automation, all enterprises will gain agility and confidence in deploying the right firewall policies, at the right time and in conformance to compliance regulations. GMS provides a coherent way to manage network security by business processes and service levels, dramatically simplifying lifecycle management of your overall security environments as compared to managing on a device-by-device basis. 2 Full DPI/Gateway AV/Anti-Spyware/IPS throughput measured using industry standard Spirent WebAvalanche HTTP performance test and Ixia test tools. Testing done with multiple flows through multiple port pairs. 3 VPN throughput measured using UDP traffic at 1280 byte packet. 4 Applies to SuperMassive 9200, 9400 and 9600. SuperMassive 9800 UC APL certification is pending. 5 Supported on SonicOS 6.1 and 6.2. 6 For every 125,000 DPI connections reduced, the number of available DPI SSL connections increases by 750. *Future use. All specifications, features and availability are subject to change. Enable your business firewall to provide real-time network threat prevention with SonicWALL gateway anti-virus, anti-spyware, intrusion prevention and application intelligence and control. Block the latest blended threats - including viruses, spyware, worms, Trojans, software vulnerabilities and other malicious code. Guarantee bandwidth prioritization and ensure maximum network security and productivity with granular policies for both groups and users. Enjoy the convenience and affordability of deploying your firewall as a SonicWALL TotalSecure solution. This combines the hardware and services needed for comprehensive network protection from viruses, spyware, worms, Trojans, key loggers and more - without the complexity of building your own security package.